NAPA, CA (October 18, 2018) – From top supermodel to a global entrepreneur today with a $2.6-billion dollar brand, Kathy Ireland’s mission is to celebrate products that “make our world better,” she told Fast Company in September 2018. 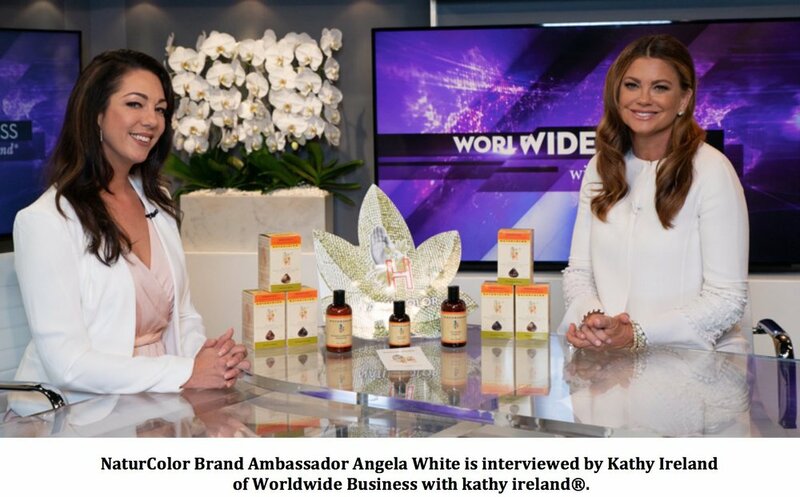 As part of this commitment to serving brands that are better for people and the planet, Worldwide Business with kathy ireland® is pleased to announce an exclusive interview with NaturColor Brand Ambassador Angela White to discuss safe, eco-friendly hair color gels. NaturColor is an herbal-based permanent hair color gel that's designed to change or enhance one's existing hair color while blending in gray. It was formulated for those who are ecologically minded and may be coloring their hair for the first time. NaturColor can be used to complement natural hair color while covering gray. It can also be used to add subtle highlights or dramatically change existing hair color. NaturColor is intended for both men and women to discreetly color their hair at home. The product was created for the busy, value-conscious consumer or traveler, male or female, young or young at heart. A complete application takes less than one hour. NaturColor is headquartered in Napa, California. White shares with Kathy Ireland in the interview segment that NaturColor has ingredients that make it better for our hair and the environment. She explains, "NaturColor uses plants and botanicals as the base, so we use every part of the plant -- the root, the stem, the leaf -- and we break that down and make extracts and oils to help moisturize the hair. It's a gentler coloring process." Available in 31 blendable colors, NaturColor permanent hair color gels are handcrafted with the finest Italian pigments derived from botanicals. All NaturColor products are cruelty free and contain no ammonia, resorcinol or parabens. They can be used repeatedly without damaging the hair, unlike many commercial chemical hair colors. JL Haber, Vice President of Programming for Worldwide Business with kathy ireland®, is happy to feature NaturColor. "It's so important for many people to look and feel their best every day. Sometimes, that includes coloring our hair. But so many hair color gels are bad for our hair or bad for the environment. Not NaturColor! This innovative product is easy to use, safe for our bodies and ecological. We're delighted to have NaturColor on our show,” he says. For more information about NaturColor's herbal-based hair colors, visit NaturColor.comand tune in to Fox Business Network as sponsored content on Sunday, October 21, 2018 at 5:00pm EST and Bloomberg International on Saturday, October 20, 2018 at 7:00pm GMT and Sunday, October 21, 2018 at 10:00am D.F. and 2:30pm HKT. Viewers can also watch the video clip here. Worldwide Business with kathy ireland® is a weekly half-hour show featuring global executives sharing their business insights and framing the opportunities shaping their industries. Hosted by a business mogul, Kathy Ireland interviews some of the brightest minds in business today. The show broadcasts on Fox Business Network as part of their sponsored content line up and globally on Bloomberg International. Worldwide Business with kathy ireland® extends beyond the weekly on-air program with digital content delivered on various video platforms and across social media. Visit www.tvwwb.com for detailed airing schedules or check local listings. For more up to date information visit Worldwide Business with Kathy Ireland® on Twitter and Facebook. NaturColor™ is a botanical-based permanent hair color gel designed to change or enhance one's existing hair color while blending in gray. This high-quality botanical product line represents a new generation of hair colorings, formulated for those who are ecologically minded. In addition, NaturColor offers shampoos, conditioners and other hair care products. NaturColor is a brand offering of Herbaceuticals International, based in Napa. CA. Visit www.NaturColor.com and follow us on Instagram and Facebook.